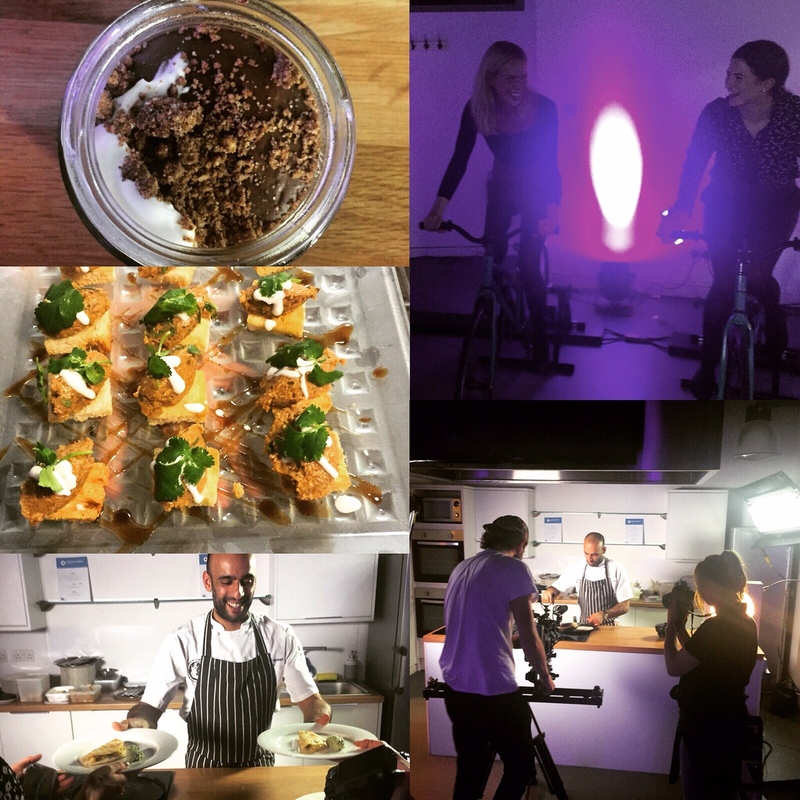 The event was held in Jenius Social- a vibrant event space in North West London, which, on a typical day offers food and drinks master-classes. For our event however, it had been transformed. 3 bikes had been set up in the kitchen area, and using electric petals technology, had been rigged up to a gas hob which our chef was going to use to individually create our dishes. Not your ordinary Tuesday night! On arrival, we were welcomed with a champagne reception and canapés. These included highlights of pulled pork crostini’s and mini smoked salmon, beetroot and peppery cream cheese bites. After a drink and a taste of Prataps cooking, it took little encouragement for us to jump straight on the bikes! After a lot of giggling and a little bit of effort, we had indeed managed to power the gas hob. We were then served a beautifully presented, delicate and incredibly Moorish coconut pancake, served with spicy Bombay potatoes. I was incredibly surprised at how little energy was required to power the gas hob- and I quickly learned that this tied neatly into the concept of how surprisingly easy it is to change your energy supplier! As the night began to wind down, we spent some time chatting to Pratap and a handful of the other exclusive guests- and tucked into dessert. An incredibly rich chilli, frankincense and ginger mousse- which when paired with a glass of red wine was absolutely incredible! By the time the evening was over, alongside feeling deliciously full and happy and not remotely guilty after the evening’s wonderful food and drink (it must be the cycling), I felt as though I had really understood the concept of the evening. If it only takes 5.2 minutes to create the energy to cook a meal, how hard can it be to switch your energy provider online? This evening can be safely labelled as a success, and I can’t wait for the next one. Difficult to put a price on this evening as it was a one off event (but I would have paid at least £40 a head for the experience). Next PostA Beautiful Escape to the Country!